I bought my Specialized TriCross in 2012 hoping it would work well as an “Adventure Bike”. When I say "Adventure Bike" I mean bike camping, distance riding on rail-trails and fire roads, and maybe even a bit of single-track touring thrown in for good measure. I had great expectations. It does great on well-maintained surfaces (the “improved” section of the John Wayne Pioneer Trail) but not so well on soft surfaces (even the tiniest bit of mud or lose gravel) or rough trails (even if they are flat and dry). As a commuter it is TOP NOTCH and I absolutely love it. After going bike camping a while back it became obvious that I put a little too much load on the bike with several days’ worth of camping equipment on the rear rack. Specialized TriCross loaded down for a bike camping trip on the John Wayne Pioneer Trail, August 2011. I looked high and low for a used model of one of the above. I even found a Salsa El Mariachi that came close to fitting the bill. 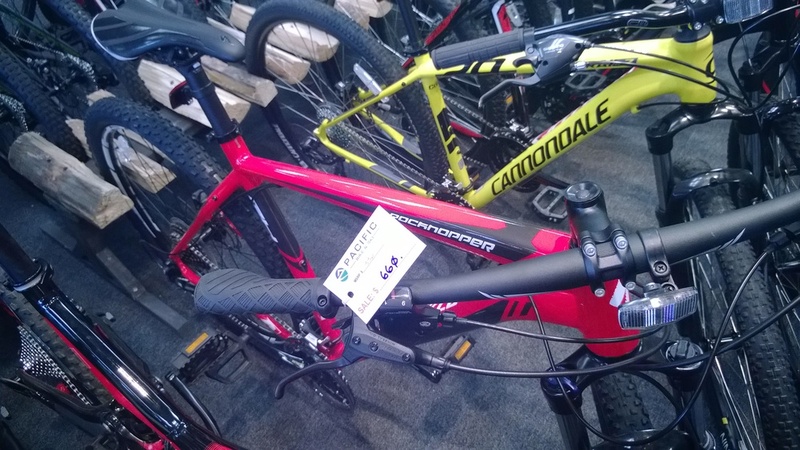 In the end all but the Cannondale and Specialized were off the list due to price alone ($1200-1500 vs. $700-900). One day I took my TriCross in for service to my local bike shop's new location (across the street from the old location, but new nonetheless). It even had that new-shop-smell. As I waited for a front-derailleur cable replacement I looked around at the bikes in the shop. Note to self: ALWAYS put cable caps on after they fall off or it will cost you a new cable and a lot of frustration. As I waited I found a RockHopper 29 in my size. I quickly took a picture of it and texted it to my wife. (Any bike must pass the WAF, or Wife Acceptance Factor) They even had a Cannondale Trail right next to it for comparison. Specialized RockHopper 29 at Pacific Bike and Ski in Sammamish. All bikes and bike merchandise were marked down 25%, their grand-opening/moving sale. Oh yeah, this was a good find. After some cajoling and convincing that, yes, I really did need a new bike (that makes 3 bikes for me) I plunked down the plastic and took it home. That night I went for a quick ride with the kids and, wow, was it fun. After just 2 days I took it on my first real ride on some single-track at Soaring Eagle Park in Sammamish, WA, not far from my house. My son joined with me in our attempt to get in an early-morning ride on Veterans Day before I had to go to work. The weather was nice and cool (i.e. not cold) and it hadn't rained in several days so the trial surface was firm with a nice covering of fall leaves. The bike was AMAZING, although the engine was a little slow (i.e. me). I had no problem keeping up with Patrick, who was in 7th heaven: he rode hard and kept up a good pace and attitude the entire time. Great stopping power on the hydraulic brakes. I've never used these before and was astounded that I could do one-finger braking (typically my middle finger). Rarely lost traction: the 29x2.1" tires were AMAZING. The flat-bar handlebar was wider than I'm used to but it made riding easier. Gear ratios were perfect for the trails we were on. Lockout on the front fork (yet another new thing for me) worked well on the flat pipeline-trail back to the car. Handling in the turns was "OK", not fabulous, by any means, but pretty good given my skill level. Saddle was just a tad too narrow but riding for short distances. I'll need a wider saddle for longer rides. Top bar is a bit too high for single-track work. No incidents this time but at this rate it is only a matter of time. Don't wear boots with wide heels, they hit the chain stays. I haven't decided if I want to put on a set of SPD pedals yet (like these) so I left the stock pedals on for this ride (the cheap plastic ones every LBS puts on their bikes for test rides). I added a mud flap for the back wheel (SKS X3 X-Tra-Dry), which helped a little bit. Once the trails get sloppy it will be of more use. I have a spare rear-rack from my old commuter bike that died a couple years ago but I have yet to try it out to see if it fits the rear wheel (disc-brake might be too wide). WOW. This little gem is only 3 miles from my house and will be getting a LOT more use in the coming months/years. Fabulous map and navigation system posted at every trail intersection. Each intersection is numbered on the post and on the map. Each post has arrows showing which points are in which trail direction. It made riding a new trail a real treat. I was afraid I would have to use my GPS to get us back to the car but that was totally unnecessary. Trails were VERY well maintained with no impassable obstacles. Some obstacles and drops were more technical than others (i..e the northeast section) but very rid-able. Inter-woven trails give you lots of route options. Fall leaves covered the small rocks and roots but this was no more than an annoyance. If they had been wet it would have been so much worse. No difficulty ratings on the trails, like they have at Duthie Hill Park (our next riding destination). Conclusion: I made a great purchase and found some great trails! This bike should serve me well in many trail and camping trips to come. 2014 Specialized RockHopper 29, my newest ride.